Lord, have mercy. ~Lord, have mercy. Christ, have mercy. ~Christ, have mercy. Christ, hear us. ~Christ, graciously hear us. God, the heavenly Father, have mercy on us. ~God, the heavenly Father, have mercy on us. ~God the Son, Redeemer of the World, have mercy on us. ~God the Holy Spirit, have mercy on us. ~Holy Trinity, One God, have mercy on us. Holy Mary, ~Pray for us. 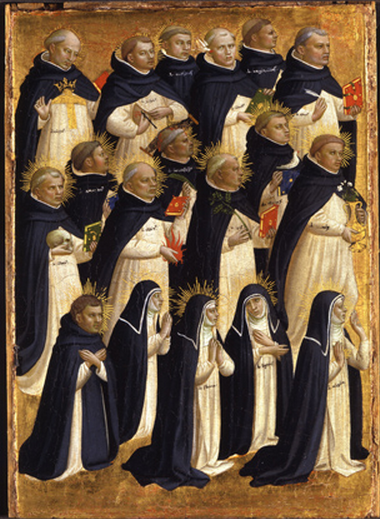 All you holy Dominicans, ~Pray for us. Lamb of God, who takes away the sins of the world, ~Spare us, O Lord. Lamb of God, who takes away the sins of the world, ~Graciously hear us, O Lord. Lamb of God, who takes away the sins of the world, ~Have mercy on us. In 2012 & 2013, Archbishop Augustine DiNoia OP sent a message to the friars, sisters and Dominican fraternities to pray the Litany of the Dominican Saints, for the reconciliation of the Society of St. Pius X (SSPX). We continue to pray for this reconciliation in the Church.